Posted on February 28, 2015 by Admin. Ninety ukiyo-e prints in the exhibition are on loan from the esteemed Hiraki Ukiyo-e Foundation whose holdings are revered in Japan. Select prints, paintings, sculptures, and other works borrowed from U.S. collections complement these prints, making the exhibition over 120 artworks. With cross-cultural and multi-generational appeal, Life of Cats takes viewers on a wild ride through Japan’s love affair with our feline friends. Roughly 50 items will be replaced with new works halfway through Life of Cats—Rotation 1 will be on view from March 13 until April 26; Rotation 2 will be on view from April 29 until June 7. Life of Cats is divided into five sections: Cats and People, Cats as People, Cats versus People, Cats Transformed and Cats and Play. View selected pieces from the exhibition below! Some J-related events in this month! On Thursday, February 26th we will be hosting our Welcome Party! We welcome both new members and old to come meet the Eboard, find out about the exciting events we are hosting this semester, play games and of course enjoy delicious food! So come through for a good time at VC 10-165 from 12:45-2:05 PM, hope to see you there! Japan Society will host a program with Visual artist Sebastian Masuda who helped launch the career of Japanese pop-star Kyary Pamyu Pamyu, the princess of kawaii. In this program, Masuda discusses his works that have drawn attention worldwide, using an explosion of color and nostalgic childhood toys from both the U.S. and Japan. He also talks about his new innovative art project, Time After Time Capsule, which is coming to New York in April. Masuda brings to his work a uniquely cute fashion sense and “kawaii culture” that is distinctively Japanese, yet contains very familiar American elements. Accompanying the lecture will be a rare selection of items for sale from Masuda’s Harajuku shop, 6%DOKIDOKI. Followed by a reception. Please join us next week for a fascinating talk by Michael Dylan Foster. This presentation will introduce “Koshikijima no Toshidon,” a New Year’s Eve ritual performed annually on the island of Shimo-Koshikijima off the southwest coast of Kagoshima Prefecture, Japan. During the event, men masked and costumed as frightening demon-deity creatures enter individual households in order to “discipline” and “educate” young children. Performed since at least the Edo period, in 2009 the ritual was inscribed on UNESCO’s Representative List of the Intangible Cultural Heritage of Humanity. This talk will focus particularly on the way in which the dynamics of “seeing and being seen” inform the performance of Toshidon and to a certain extent the everyday lives of the islanders. An understanding of Toshidon through the lens of vision and the gaze provides insight into broader questions of tourism, UNESCO, and the production of heritage in Japan and elsewhere. 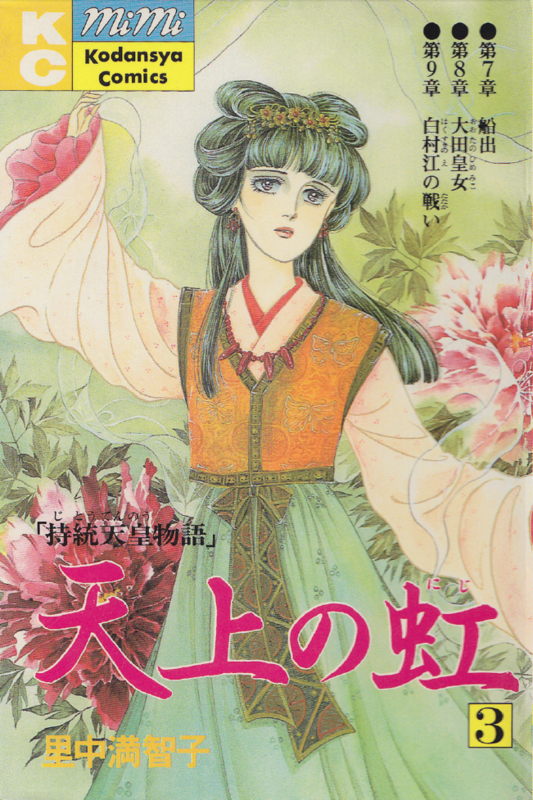 We hope you all enjoyed our first event; Shoujo Manga Symposium! For those who couldn’t make it don’t panic as we have other great events in store this semester! Join us next week on, Tuesday, February 24th for our Career in Japan Information Seminar! An exciting seminar that will be led by Mynavi Representative, Naomi Osawa-San who will be discussing in detail the customs and practices of job searching in Japan. Topics of discussion will include recent entry-level job market trends in Japan, tips on a Japanese-styled resume, tips on a Japanese-styled interview and more! A Q&A session will also be offered for any questions you may have. We encourage you to take advantage of this very informative seminar and hope to see you there! Posted on February 20, 2015 by Admin. We need some Mandarin-speaking students to help with a group of educators from Beijing on Monday 2/23,Tuesday 2/24, and Thursday 2/26 from 7:30 AM to 4:30 PM each day. You would be meeting at Days Hotel; 215 West 94th Street in Manhattan. The stipend is $125 cash per day. Lunch is included. You can sign up for 1 day or for all three. If you are interested, please contact Doris at dpokras@projectvisiongroup.comas soon as possible. Posted on February 13, 2015 by Admin. Opening Reception: Wednesday, February 3rd from 6 to 8 pm at Sidney Mishkin Gallery. 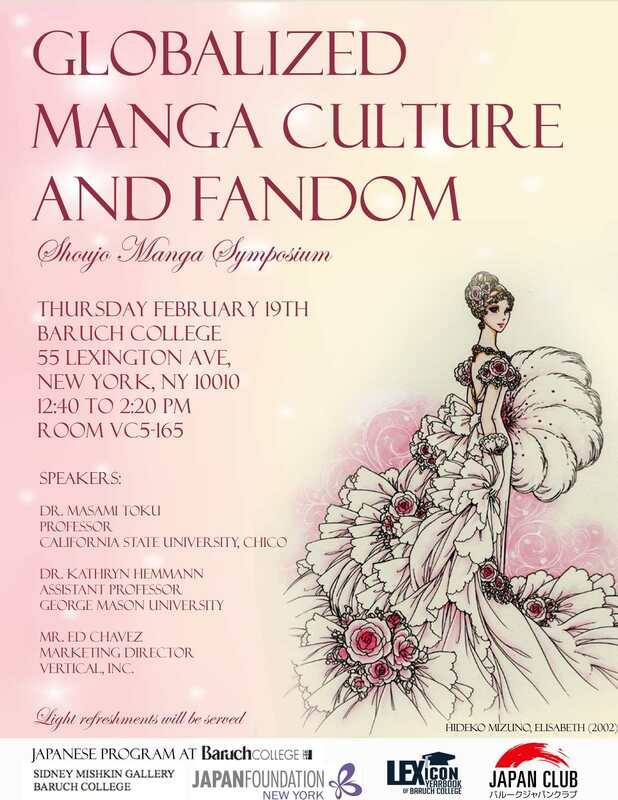 In addition, there will be a mini-symposium “Globalized Manga Culture and Fandom” on Thursday, February 19, 12:40 to 2:20 p.m. Vertical Campus, 55 Lexington Ave., 5th floor, Room 165 (Photo ID is required for entrance to the building). Mr. Ed Chavez, Vertical, Inc.
To reserve a seat for the symposium, please register on the website below. Both events are free of charge and open to public. The events are sponsored by the Japan Foundation, New York. The symposium is also sponsored by Baruch Japan Club. Posted on February 12, 2015 by Admin. The goal of this year’s program is to better understand how media technologies have transformed the category of celebrity and fame in Japan to produce new modes of socially mediated publicness. Consumer-information society has given rise to a culture of celebrity, wherein fascination with stars, pop idols, and personalities has erased the distinction between the public and private lives of individuals, and produced a society wherein spectacle, self-promotion, and surveillance structure everyday life and politics. This year’s program will be focusing on film, television, and social media. It will examine socially mediated publicness in its many forms, including idols, voice actors, film stars, and television and net celebrities. It will examine how audiences are organized into fan communities for the consumption of goods and services, how fan and social activities are productive of capital, and how public figures hold affective and social meanings for audiences and collaborators. The two-week summer program consists of two parts: lectures and experiential learning. The main organizers, Jason G. Karlin (University of Tokyo) and Patrick W. Galbraith (Duke University), have designed an intensive two-week program that will explore the theoretical and methodological connections between celebrity studies (persona studies) and audience studies (fan studies). The first week of the program will focus on transformations in the presentation of the public self. Professor P. David Marshall (Deakin University), serving as keynote speaker, will discuss how celebrity has become a powerful and pervasive trope in contemporary culture. For the second week, Professor Matt Hills (Aberystwyth University) will frame how audiences are attracted to and shaped by their shared interest in media objects as fans. Other lecturers tentatively include Gabriella Lukács (University of Pittsburgh), Noriko Manabe (Princeton University), Hideaki Fujiki (Nagoya University), Takako Inoue (Daito Bunka University), Akiko Takeyama (Kansas University), Kazumi Nagaike (Oita University), and Shunsuke Nozawa (Dartmouth College). Taking the discussion out of the lecture hall, the program also includes various opportunities for experiential learning. In addition to visiting media archives, the program will conduct surveys at various fan events, as well as structured group interactions with media industry insiders and aspiring idols, voice actors, and Internet stars. The summer program will provide participants with various opportunities to engage with contemporary Japanese media culture. Our hope is that the participants will pursue work related to Japanese media and popular cultures in the future, whether as critics, researchers, creators, producers, or editors. The program will accept 15 graduate students from universities around the world, who will collaborate with graduate students from the University of Tokyo. The program will be conducted mainly in English (though Japanese will help facilitate encounters and interactions outside of the classroom). One of the aims of the program is to produce an edited volume with contributions from the participants in the summer program. This volume will be produced for undergraduate education on Japanese popular media culture. Each participant’s contribution to the planned edited volume will be about 3,000 words and will be prepared and submitted in the months following the summer program. Details regarding the participants’ submissions to the edited volume will be discussed during the summer program. I’d like to introduce upcoming Japanese events at J-Collabo to classmates and Japanese club so please share this information! We will have Yukidoke(snow melting season) Festival on Feb. 22 Sunday from 2PM-8PM. From 2PM to 6PM, there will be six arts and craft workshops of Ishikawa Prefecture such as making traditional spinning top, how to wear Kimono and tea ceremony. Students will get 50% discounts to attend workshops! Also, we will host Renjishi Performance from 6PM to 8PM. Renjishi performance requires RSVP. Classmates can reserve to info@j-collabo.org. After the performance, there will be a raffle to win prizes! If they make a group reservation (minimum 5 people), they will get extra raffle tickets only for group reservation teams. As you know, I’m doing an internship at J-Collabo and we need many volunteer staffs who can help us at that day. It is a good chance to work with native Japanese professionals and artists. If classmates want to work with us, they can reach me at myungji.chae@gmail.com.